You don’t have to put up with being put down or being made to feel small. You don’t need me to tell you how much it hurts to be repeatedly put down or made to feel small. It hurts even more when you’re being put down by someone close, someone who should be supporting you, perhaps even celebrating everything you are. You’re likely to be feeling stuck. Like you don’t have options or that you’re powerless to change things. All you know is how horrible the situation is and how much you want it to stop. I strongly believe that it’s totally unacceptable to put someone down just so you can feel a little better. It’s unacceptable to keep making someone else feel small so you can feel big. And it’s unacceptable to strip away someone’s confidence until they feel totally stuck. But this isn’t about the person who’s giving this out and treating you badly. This is about you. Having coached people through this before there’s one thing I know. You can have something better, something different, something that allows you to flourish rather than diminish. It just starts with a choice. What would it be like if you could rise out of the situation you’re in and see an end to the hurtful put-downs? You don’t need to earn it or prove that you’re worthy of being treated with respect and consideration – you are already worthy of it. In working with people who have been on the receiving end of hurtful put-downs, I’ve seen how small changes can make a huge difference. I’ve witnessed people get back in touch with their self-confidence and I’ve watched as they’ve been able to dial up the texture of their life and relationships. I’ve seen people feel better, feel whole and feel positive again, and I have to say, I bloody love being a part of that. In Staying Up When You’re Put Down, I’ve taken the same strategies, exercises and insights that I use with my clients and put them in one place where you can benefit from them too. My aim with “Staying Up When You’re Put Down” is to offer you everything you need to change things for the better, and to be experiencing the benefits by the time you’ve finished working through it. You get instant access to the PDF, packed with specific and actionable strategies for building up your natural self-confidence and 9 step by step worksheets take you gently through everything you need to know. It’s easy to pull back because you’re scared of rocking the boat, or scared that things will get worse if you say something. Just not knowing which way to turn or what the “right move” is is scary in itself. I get that. I really do. That’s why my approach gently gives you the tools you need to do this in a way that works for you, not against you. To recognise the fact that you deserve to be treated with respect and consideration, and to make a choice that honours that. That’s the only way the situation will change. 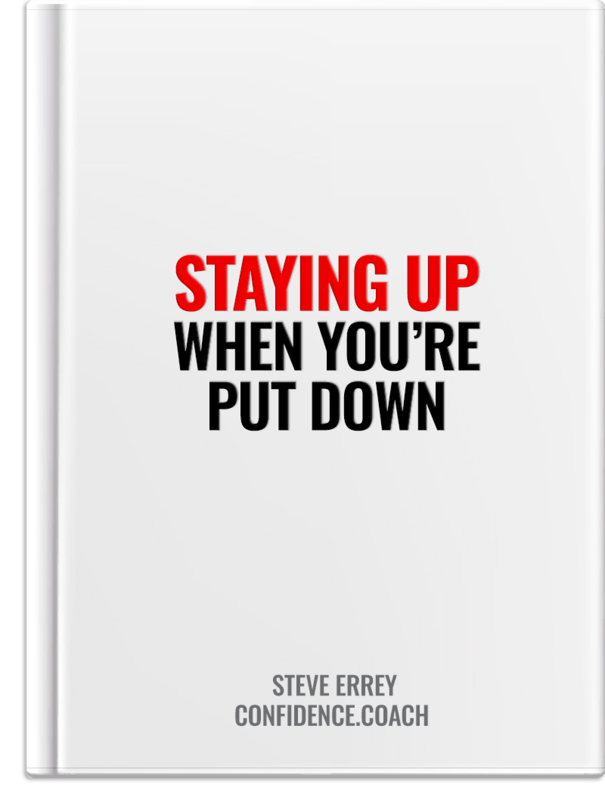 Just click the button to pick up your copy of Staying Up When You’re Put Down and you can make a start right away.